18th Annual Charity Golf Tournament a Success! The weather held off on September 11, 2013 as we teed off our 18th Annual SymQuest Golf Tournament at the Country Club of Vermont. After a successful day, 75 SymQuest clients from New Hampshire, New York and Vermont helped us raise $4,550 for the Central Vermont Community Action Council. CVCAC helps people free themselves from poverty through individual and family development. Nationwide Community Action Councils support over 40 million Americans living in poverty in both rural and urban areas and have become leaders in education on poverty issues, advocacy on behalf of low-income families, and developing innovative strategies and programs to reduce poverty. SymQuest is honored to have the opportunity to contribute to this deserving charity. 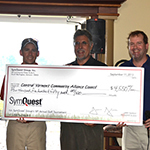 Our 1st Annual SymQuest Golf Tournament in Maine will take place on September 25th in Gray, ME and will raise money for the Opportunity Alliance.